Standard magnetic separators generate inhomogeneous magnetic forces and fields. When production is scaled up, the inhomogeneity increases even further. Magnetic beads far from the magnet move much more slowly than those closer to the magnet. If you increase the force and/or separation time in order to capture the beads far from the magnet, you will increase the risk of irreversible bead aggregation in the beads that start near the magnet wall. In contrast, homogenous biomagnetic separation systems can generate the same force regardless of the scale of production or model of device. Since forces can be kept constant when moving from R&D to production (i.e. development using a SEPMAG A in the lab to production using a SEPMAG Q), the beads are in the same state and experience the same forces in each device. When we maintain the same force on the beads, the beads will move at a constant speed in both the R&D lab and the production line. Therefore one can, for example, use a 50 ml centrifuge tube with a diameter of 30 mm in a SEPMAG A125 ml device. The optimal separation time (with losses below 1% and no resuspension problems) is determined in the lab to be 65 seconds. 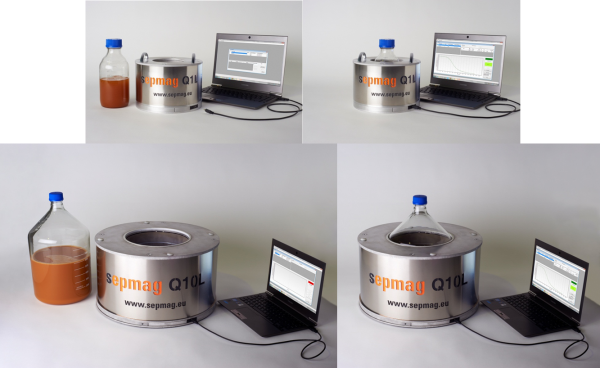 If one moves the same process to a SEPMAG Q1L device using 1 Liter bottles with a radius of 55.5 mm and the same concentration of beads, the estimated separation time will be 65 * 55.5/30 = 109 seconds. Therefore, homogenous biomagnetic separation conditions guarantee consistency regardless of volume and enable developers to easily determine the optimal separation time for their product (i.e. no material loss and no irreversible aggregation) at each volume. Check www.sepmag.eu/resources to access to FREE eBooks on the subject, or contact us. We will be glad to help you to achieve an efficient magnetic bead separation process!